I like to collect bad reviews of my books. If there is some valid criticism, that can be constructive - but more often they are just a bit of misguiding ranting. There's one I have a soft spot for, from the head of the Einstein archive in Jerusalem, slating my (trade, popular) biography/anthology of Einstein for not being an academic book and being just the type of book they try to keep out of print. But this new one has just taken over as my favourite. It's from the Barnes and Noble website. I found it while looking for an image of the book's cover without that irritating 'Look inside' arrow that Amazon plasters over the top right-hand corner, making the image useless for all other purposes. The WORST childrens Book EVER! Offensive! 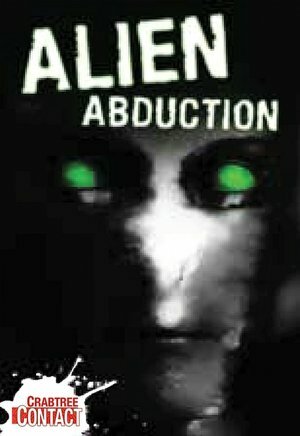 In [Stroppy Author's] book Alien Abduction, she presents FICTION as FACT to young readers. It speaks of what aliens physically "do" to you when "You are abducted." It incites fear and trepidation in the fragile minds of children. 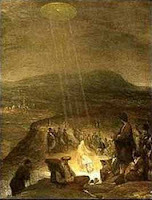 Also, it depicts a BLASPHEMOUS painting of the Baptism of Christ by Aert de Gelder, in which she then suggests aliens are connected to Christ.One quick look at the authors' website and you will know exactly the type of values, and her MISSION to "educate" children. Parents BEWARE! Do your homework on what books are in your child's school and home libraries. I'm inclined to send SadApostrophe round to teach this person a lesson. I would point out, though, that 'one quick look' at my website will show I never claim to have a 'MISSION' and I don't use the word 'educate' once. Of course - because I'm too busy inciting fear and trepidation in fragile young minds. If I had a mission it would be to free children from the shackles of the National Curriculum, literacy hour and fundamentalist religious views of all varieties, and to corrupt their young minds by exposing them to the wonders of the real world, and to the vast expanse of possibilities available to them. That BLASPHEMOUS painting is just down the road from here, in the Fitzwilliam Museum, Cambridge. Perhaps it has corrupted me. This book is one of a series of three that did not go down well with mid-Americans. 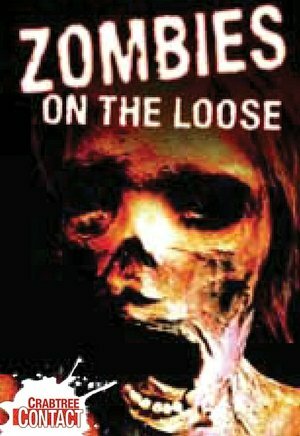 Another in the series, on zombies, was one of the 19 books banned in 2010. I wrote about the banned books list for New Humanist, so the banning got me extra money. Don't they realise how this kind of fuss just promotes the book? Thank you for submitting your story for consideration. Sadly, it does not meet the criteria for our list. One of the criteria is 'not written by Stroppy Author.' Please read our submission guidelines more carefully in future. Enough time-wasting. The point of this series is to pass on the writer's insights into publishing practice that fall out of this venture. Whether the venture will work, I have no idea. I have run a publishing company before, so I'm not a total novice. But it was a long time ago, and my boss was a balloon (orange) and we were publishing very different things, so most of this is new. For one thing, there is no balloon. Perhaps there should be? I'll think about it. After all, I know I can offset the balloons against tax - I've done it before. Today's view from the bridge shows..... why it takes publishers so long to respond to submissions. I have answered the queries quickly, and now I have some MSS to look at and it has all slowed down. As authors, we always get impatient and panicky about that. Now I know why it is. It takes a long time to read manuscripts - much longer than to read query emails. And there are plenty of other things to do, such as checking page proofs and looking at editorial feedback. And all the other things are more urgent. If I don't check page proofs, books are printed with mistakes in. If I don't read a manuscript, it just sits there until tomorrow. Important, but not urgent. It's one of those days when I love my job. 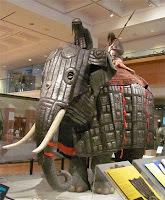 I just sent an email to my editor that included the line 'the ethnicity of the ostrich is not recorded', and spent the afternoon doing picture research to brief an illustrator who needs to show an ant with cordyceps (parasatic fungus) growing out of its head, one of Damien Hirst's sliced cows, and a Timurid war elephant. Actually, he'd got the war elephant spot on. 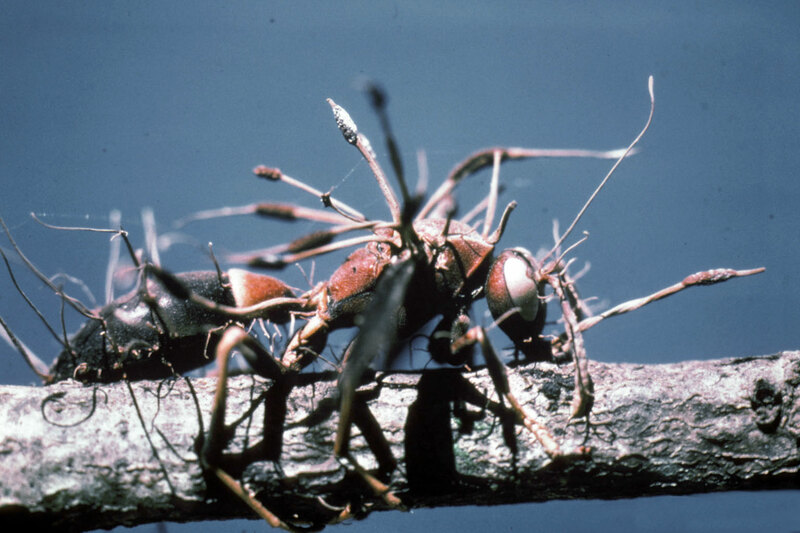 The cordyceps grows from a spore inside the ant and turns it into a zombie. Eventually, the cordycep bursts through the ant's head or body and spreads more spores to other ants. The infected ant has the sense to get well away from the nest before its unfortunate day with the spores to minimise risk to its co-ants. It's not a pretty sight. 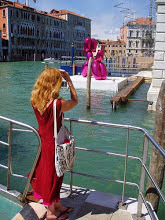 Damien Hirst doesn't need much explanation. Anyone with a power saw, a herd of cattle and set of oversized tanks of formaldehyde would do the same, surely? The elephants were cunningly scared away by Timur's trick of setting light to camels and sending them crashing into the approaching elephants. Not so good for the camels, so probably not one to try if you wish to re-use your camels later. The ostrich? Well, an Italian-American called Ping Bodie once won a pasta-eating contest against an ostrich called Percy. Percy fainted after the 11th plate of spaghetti. The ethnicity of the participants was a topic for discussion as the (very fine) illustrator had drawn Ping using chopsticks, probably misled by that very Chinese-sounding name. But, no - Ping was a professional basketball player, as Italian-American as they come. All from page proofs of Revolting Records, for Barrington Stoke, published in August (I think).. Because I wrote it a while ago, I could enjoy it all afresh. And realise again how much I do like this job, even if I grumble about it from time to time! A week ago, I did something that seems insane for a person who makes a living from writing books - books that have to sell. Something my publisher would hate. Something I would never have expected to do. And that was ask my Facebook friends not to buy my books. Lots of my friends had received an email from Amazon saying that one of my (six) vampire novels was published on 1st March. (It wasn't, actually, as they're running a bit late. But no matter.) It looks like a good deal - a nice vampire novel by me for £5.99. Shouldn't I be pleased? No. Because there's no mention from Amazon that it is one of a cycle of six, or that they are novels for teen reluctant readers, so only 8,000 words long. What might have looked like a lovely, affordable, friendly and supportive gesture - £5.99 to buy a novel I've been alternately grumbling and enthusing about for months - suddenly looks like a rip-off. The whole cycle will set you back £36. That's rather a lot for a friendly gesture. And, actually, even £5.99 is rather a lot when you find out how short the book is. Unless you are a reluctant teen reader, in which case it is brilliant value, and probably your school or library (or parent) paid for it anyway. But my Facebook friends are not teen reluctant readers. I don't ever accept friend requests from readers, so I know they're not. I can't imagine how Amazon is targeting my Facebook friends. I assume they're not, actually, and that they're sending these messages to people who have bought others of my books or searched for them on Amazon. I hope there is nothing more sinister, anyway. But I don't like it and I wish there were a way to stop it. I don't want my friends to be disappointed or annoyed that they have bought a book that isn't what they want, isn't suitable for them and isn't quite what it said on the Amazon tin. If my friends know what the books are and still buy them, that's wonderful and I will be really happy. But I'd rather they weren't bounced into buying them. So - if you're a teacher or librarian or the parent of a teenager who struggles to read a long novel (or just doesn't want to), please do buy the Vampire Dawn novels. But everyone else - make sure you know what they are before you buy. 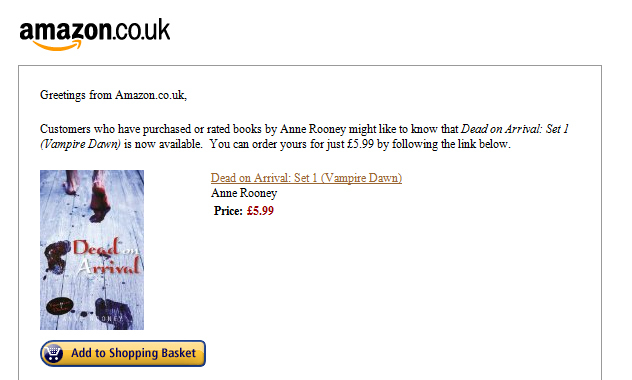 And, Amazon, please don't put me in the position of having to ask people not to buy my books! You can find out if they are what you want by looking at the vampires' website. Open a book at any page. That's a double-page spread: the left-hand page and the right-hand page together. Easy, isn't it? This post will have some copyright-violating pictures of double-page spreads. I am showing these for the purposes of review and comment, OK? And I think these are good books, so I could even suggest you buy them. Let's start with picture books. The two pages of a picture book spread can be used as a single entity or as two. If you use them as a single entity, there is often text on only one side (if there is any text at all). Whether the text is on the left or the right depends on how the picture is using the space. A very traditional layout has the picture on one side and the text on a white background on the opposite side. You can use the picture to build up to the text (on the right) or you can use the text as a surprise following the page turn (on the left). 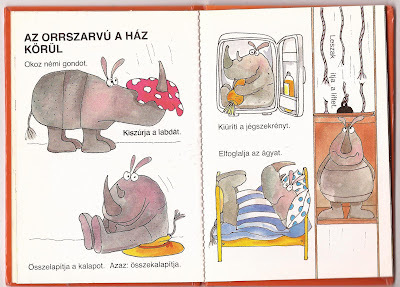 When you are planning a picture book, you need to think about where the page turns come, so don't spoil a surprise by having it visible on the right while the reader goes through the build-up on the left. This spread contains a surprise set up on the previous spread. To maximise the impact, most of the spread is taken up by a rather cryptic image and the surprise comes right at the end, a single word on the far right. Alternatively, you can cram the page with small pictures, like a comic book or graphic novel. The double-page spread is wonderfully versatile and when used well contributes to the meaning of the book. But the rule of the spread is notoriously pernicious in non-fiction. The amount of information on a topic is limited by the page design rather than the needs of the reader. Silly, isn't it? A hard topic is not allowed more space than a simple topic because they both have to fit onto the same sized spread. On this page, Oswald Mosley is given as much space as Hitler! Often, the visual appeal of the spread is pre-eminent. On this page, the information that could be included was restricted by the size and positions of the text boxes, and they were determined by which bits of the image could be obscured and the aesthetic properties of the wiggly line. Fairly obviously, a double-page spread comprises two pages: one on the left and one on the right. The first half of a spread always has an even page number. Working spreads are those which you are actually allowed to use as content (as the author). The first working spread is often pages 4-5, with the pages before that used up by gumph (official name 'prelims') such as the title page and perhaps a contents page. In case it's not obvious, v, r refers to verso (=left), recto (=right). To finish, here is a spread from my favourite picture book which makes supreme use of the double-page spread. Every spread is the same except for the toucan's eye, the beak, and the text. The shape of the die-cut pages, with the two halves of the spread struggling to get apart, embodies the sentiment of the book. It has only 70 words and contains the brilliant line: 'je déteste ce crétin prétentieux', and it's heartbreaking. Love it!